Golden Alexander has been a great performer in our yard on our sunny, sandy hillside. Flowering right now, it provides excellent early season color. It's a taller perennial native, reaching heights of around 36" with bright yellow, umbel flowers. Plant in combination with Wild Lupines or Prairie Phlox which flower around the same time. 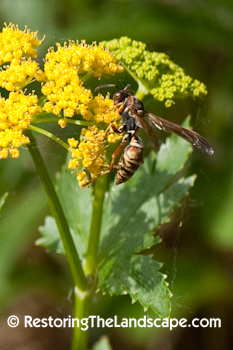 The number and variety of insect visitors to the Golden Alexanders has been fascinating to observe. 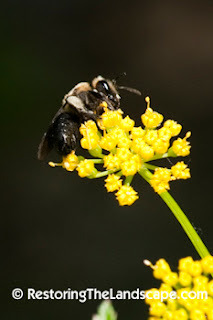 Many native bee species including Mining Bees (Andrena species) visit the flowers regularly. 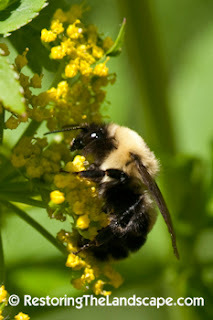 Also three different species of Bumble Bees, the larger ones weigh down the flower heads as they land. 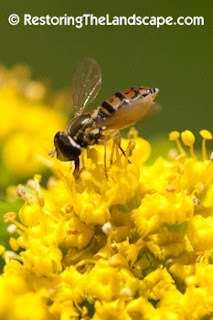 Several Syrphid (Flower) flies also like to visit the flowers. 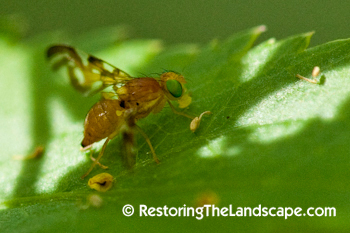 With all the insect activity on the flowers above, the anthers and bits of pollen were falling to the leaves below where this tiny Sunflower Maggot fly was feeding. Some of the first flowers I've seen the Northern Paper Wasp visit this spring were Golden Alexanders. 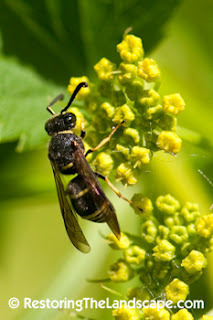 And a beautiful black and yellow, tube dwelling Mason Wasp (Euodynerus foraminatus) was also a common sight. 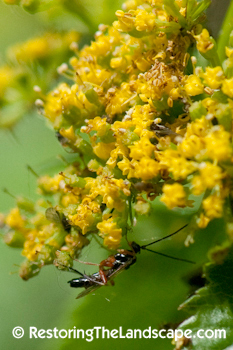 Many of the stems just below the flowerheads were covered in black aphids, sucking away on the plant juices and providing the tending ants with a nectar reward. It didn't take long for the ladybird beetles to notice the aphids. 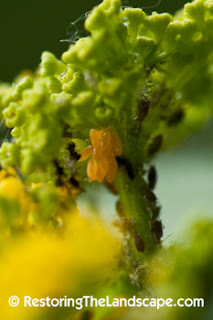 Many were crawling around on top and below the flower heads checking out the aphid activity. 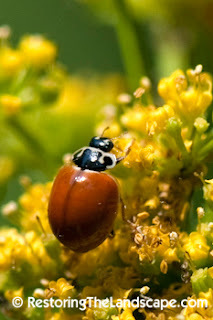 Just a day later, ladybird beetle eggs had been deposited near the aphid clusters. The hatching larvae love to feed on aphids. What good biological control in action. This parasitic wasp was checking out the aphids as well, possibly preparing to parasitize the aphids or the soon to be hatching lady bird beetle larvae. 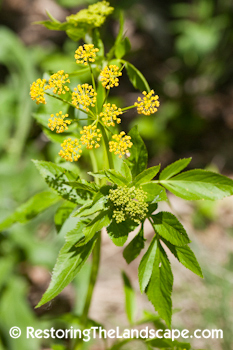 Golden Alexanders fall in the Carrot or Apiaceae family, which are one of several larval host plants for Swallowtail butterflies. I'll be watching for caterpillars soon.